It’s Mad Love and then some in War of the Poses when Dr. Bartholomew earns Harley’s ire and she arranges a sting of stings to teach him a lesson. Unlike those previous occasions, Joker let her down instead of backhanding her away. They joined hands, turned to Bartholomew and, moving as one… they bowed. Then they turned away again, and Joker began “escorting” Harley back to her cell by her hair. Don’t mess with the Quinn. 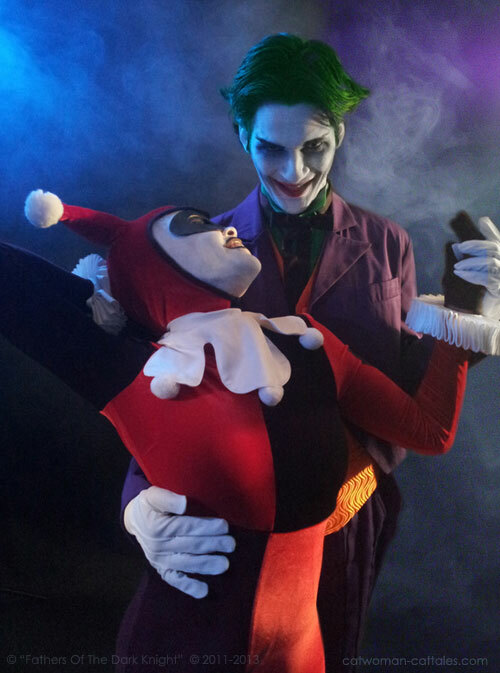 2014 will mark the world premiere of “Fathers of the Dark Knight” an ambitious theatrical production about both the fictional heroes and villains of Gotham and the real-life men who created them. The play – which will fittingly open in New York City, the inspiration for Gotham – seeks to correct the failure of history to recognize the contributions two men, writer Bill Finger and artist Jerry Robinson, made to the world of Bob Kane’s Batman. The audience will get to watch the creative process of Kane, Finger and Robinson brought to life in two different ways: On one side of the stage, we see the three men in Kane’s apartment, gradually bringing Gotham and its colorful cast of characters into being. On the other side, those very characters will fight the never-ending battle of good versus evil, as Batman takes on villains such as Joker, Riddler and Catwoman with the help of heroes like Batgirl and Robin. “Fathers of the Dark Knight” is a not-for-profit stage production documented on their website, including cast appearances at New York Comic Con.